Gan Lu is potentially a sensitive leaf depending on the weather conditions at harvest. You may find that you need to use hotter or cooler water than what you normally use for an early Spring Green Tea. 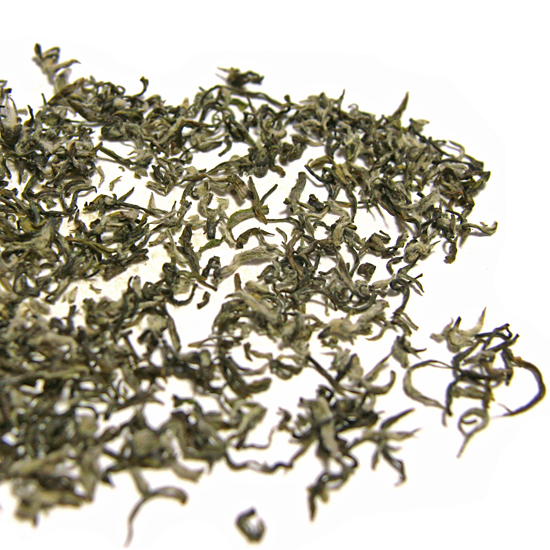 Being considerably inland, Gan Lu is often among the earliest of the green teas harvested, some years rivaling Yunnan for the earliest production. When the season is early, this leaf may be quite delicate, so watch your steeping time and water temperature! In the high elevation tea gardens on Mengding Mountain in Sichuan Province, sweet and tender early spring tea buds are covered with soft, fluffy down. The most coveted batches of Gan Lu are from the Pre-Qing Ming 1st Spring Harvesting Season, which begins on Mengding Mountain in the middle of March and ends on April 5th. These tiny buds yield a refreshing tea that possess a slightly-earthy/nutty taste punctuated with beguiling, delicate sweetness and a lovely floral aroma. Despite the small size of the leaves, this tea delivers a satisfying cup. This very appealing quality has earned this tea the name, Gan Lu, or Sweet Dew. Mengding Mountain Gan Lu is cultivated in the vicinity of the original tea gardens at Gan Lu Si Temple, where Wu LiZhen is reported to have planted the first cultivated tea bushes in China around 53 BC. This tea was enjoyed by Song dynasty Emperor Xiaozong ( r. 1162-1189), who gave Wu LiZhen the title Master of Sweet Dew. While many of China’s teas have been in production for centuries, Gan Lu is considered to be one of the oldest green teas in continuous production. It is an important early spring tea since it became an Imperial favorite during the Tang Dynasty (960-1279). The harvest of Gan Lu is small and most of the production is consumed domestically or in East Asia. We are thrilled that again in 2018 we have obtained this excellent Pre-Qing Ming tea for our customers. Many of you have become loyal fans of this tea over the years. This season we have the 250 gram, paper-wrapped option which is the ‘original’ packaging, how tea customers in China purchase this Famous Tea. We will have several teas in this traditional packaging in 2018. This is a very special tea for lovers of sweet, distinctive, regional and seasonal China green teas. Do not wait too long to order this tea, as it sells out every year!